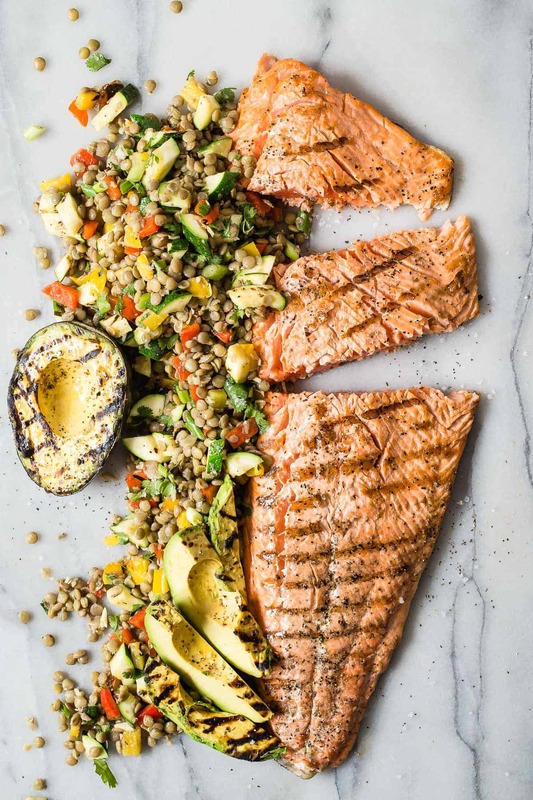 Premium Copper River King Salmon grilled with salt and pepper and served with a green lentil and grilled vegetable salad. It’s no secret that Alaskan salmon is pretty high up there in the worlds best salmon category. The fresh waters and natural outdoors help make the Copper River King Salmon to be one of the tastiest fish you can throw your dollars at. As a family we eat a lot of salmon. Whether it’s grilled or baked in the oven, it’s always a winner! I grew up eating it and now my kids are following tradition, even inhaling chunks of raw salmon anytime we have sushi. My six year old recently got tired of the California Roll he would alway order and asked for a seafood salad full of sashimi. I gave hime the raised eyebrow and planned to share it with him because I was sure he’d never finish it. He ate the whole damn thing! 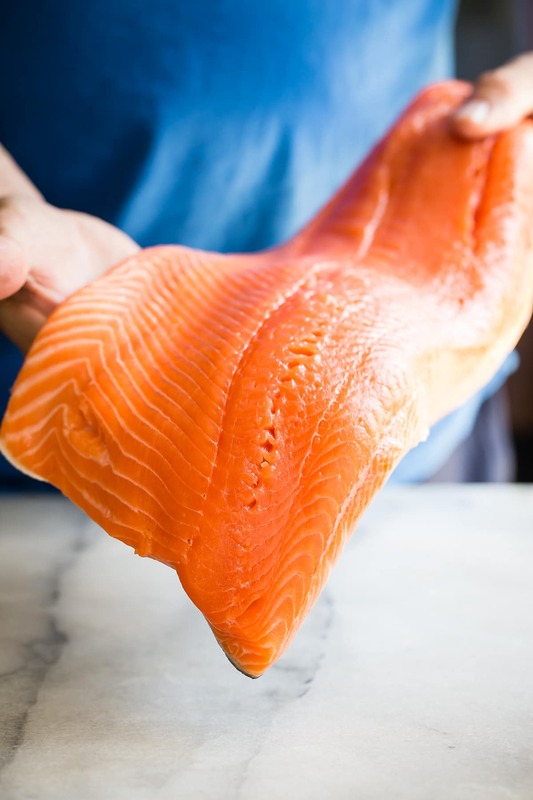 Copper River Salmon is only available for a few months of the year. King salmon has an even shorter catch window of a few weeks making it the most sought after with it’s high oil content and super orange color. Once you taste King salmon, you might be sad to go back to your “regular” salmon afterwards. Because Copper River salmon have to travel hundreds of miles to reach spawning ground, they stock up on fat for energy. It’s this fat that makes the King salmon flavor ridiculously good. 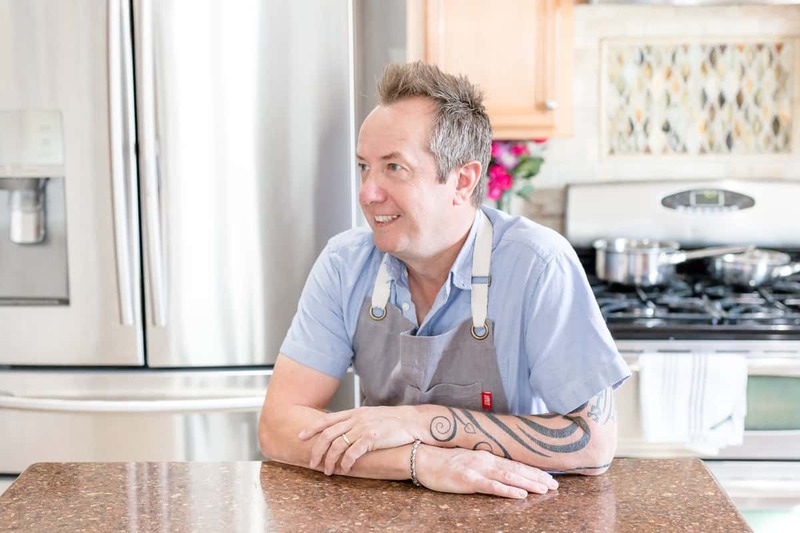 So how should you cook such an awesome piece of seafood? I grilled it! Salt and cracked black pepper was all it needed. Set it down on a really hot grill and let it sizzle. I prefer mine with the center still slightly rare, so about 8 minutes each side was perfect. 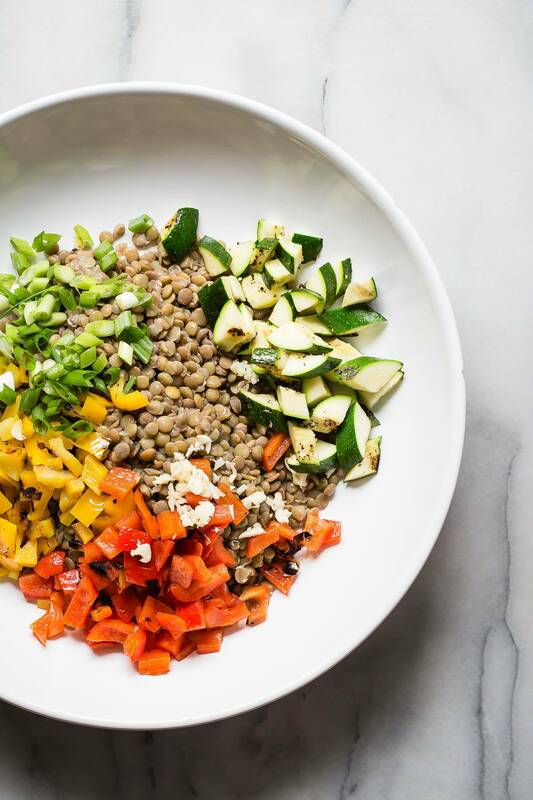 The lentil salad is crazy easy too and no need to soak your lentils. I bought a bag and they took 30 minutes to cook, I used stock for extra flavor instead of water. Add a bunch of grilled veggies including grilled avocado which is my all time favorite way to eat it these days, and toss the whole thing in a red wine and basil dressing. Grilled salmon is my spirit animal me thinks. This Copper River King Salmon was provided to me. All thoughts and opinions are always my own and I love to share quality products that I love, with you! 1 pieces large filet Copper River King Salmon whole or cut into individual . Add the lentils to the stock and 1 cup of water in a pot and bring to a boil. Simmer for about 25 minutes, Drain and cool. In a blender mix the red wine vinegar, basil, salt and pepper. Slowly add the olive oil until well mixed. Set aside. Lightly season the salmon with some salt and black pepper and rub each side of it with 2 tablespoons of the olive oil. Place the peppers, sliced zucchini and avocado on large plate. Drizzle the veggies with the remaining olive oil and season with salt and pepper. Place the salmon carefully onto the hot grill skin side up and let it sear for about 8 minutes. Using 1 or 2 large spatulas flip the salmon over and repeat. While the salmon is cooking, place the veggies on the grill and cook until they get a good dark char on them. 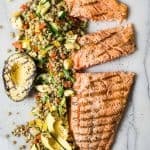 Transfer the veggies to a plate and take the salmon off the grill. Let it rest covered with some foil. Add the cooled lentils to a large bowl. Scrape any loose burned pieces of skin from the peppers and chop into small pieces. Add to the lentils along with the chopped grilled zucchini and green onion. Add half of the dressing and taste. Add more salt, pepper and dressing if desired. Toss well and serve along with the salmon and grilled avocado. Beautiful!! 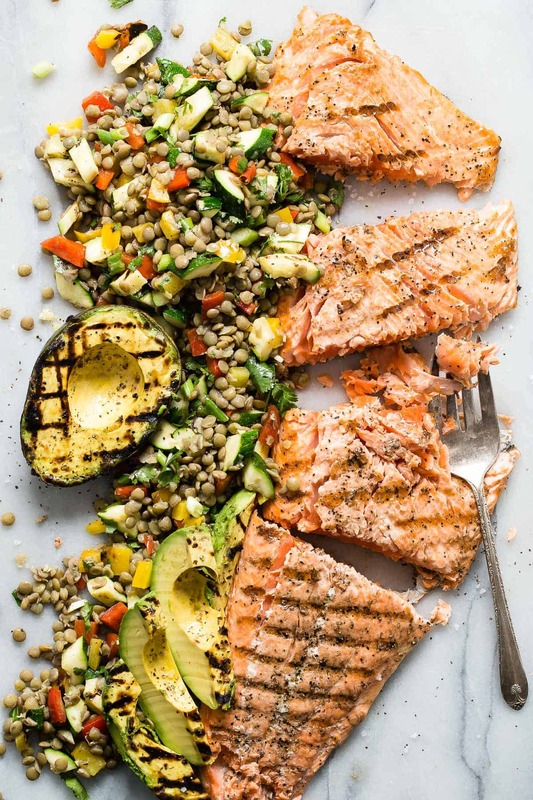 I love salmon with lentils, I usually do them hot ala Ina Garten but this looks perfect for summer. Salmon on the grill is so incredible. Is the King salmon gamey? I feel like every time I try to get “better” salmon it is too fishy in flavor for us. Hot would be awesome too Becky!! This looks totally amazing, Gerry. A perfect summer meal. That photo of the uncooked salmon is gorgeous! I fell in love with Copper River Salmon when I went to Cordova Alaska a few years ago and now I am always on the lookout for it this time of year. Such a beautiful dish, Gerry! Thanks Brian, it tasted incredible!! Where does the 3 cups of chicken stock come in? Hi Renee, the stock is to cook the lentils in. Thanks!